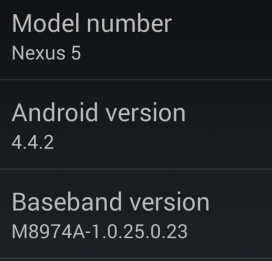 Google only started the Android 4.4.1 update last week, but it looks like a new hotfix is already good to go, as 4.4.2 showed up for Nexus devices in the last hour. So far, we've seen it on the Nexus 4, Nexus 5, and the Nexus 7, but it's probably safe to say the Nexus 10 is not going to be far behind. Update: Nexus 10 confirmed too.